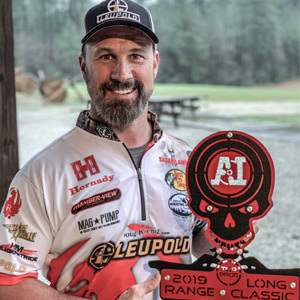 Sturm, Ruger & Company, Inc. (NYSE-RGR) is pleased to announce that Team Ruger's Captain Doug Koenig claimed the production division win at the Accuracy International (AI) Long Range Classic hosted at Altus Shooting Solutions in Baker, FL on March 2. The AI Long Range Classic is a Precision Rifle Series (PRS) competition that incorporates a challenging, 16-stage course of fire designed to test the precision rifle competitor on accuracy, time and gear management, all while engaging an assortment of reactive and moving steel targets at distances ranging from 300 to 850 yards. "I started shooting PRS a little over a year ago and I really love it," said Koenig. "The movement and diverse shooting positions that you encounter in this sport always keep it fresh. There is a steep learning curve whenever you start another shooting discipline, but I'm having a great time shooting my Ruger Precision Rifle." According to PRS standards, "production division rifles are not permitted to be altered or improved in any way from the original factory configuration." The rifle is also not permitted to exceed $2,000 USD in retail price. Koenig claimed top honors in this division shooting the Ruger Precision® Rifle chambered in 6.5 Creedmoor, finishing with a final score of 133.00. The Ruger Precision Rifle boasts high-end features like a cold hammer-forged, chrome-moly steel barrel with 5R Rifling manufactured with minimum bore and groove dimensions. This barrel coupled with an aluminum free-float handguard with Magpul® M-LOK® attachment slots provides enhanced long-range accuracy. The Ruger Marksman Adjustable™ trigger and 20 MOA Picatinny rail allow for increased long-range capabilities and make the Ruger Precision Rifle the ideal competition-ready rifle for the most discerning PRS shooters.